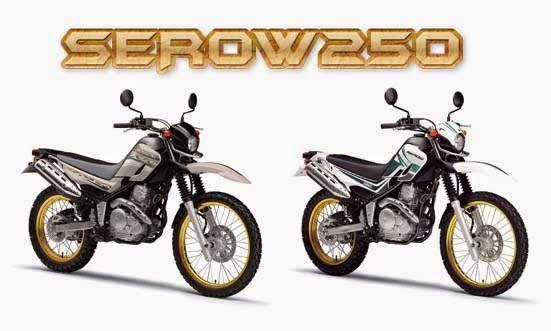 Yamaha Serow 250 Specifications - Yamaha Serow equipped with engine capacity of 249 cc Fuel Injection, single cylinder, Air Cooled, 4-stroke, SOHC, 2 Valve juxtaposed with a 5-speed transmission. The machine is capable of producing power 14 kW at 7,500 rpm and a torque of 19 Nm at 6,500 rpm. Eadlight: Ride in perfect visibility with a 100mm headlight made from a 60/55 W compact halogen bulb. Tires: Aluminum rims and tires provide great grip and reduce road noise. 2.75 - 21 45P front tires and 120/80 - 18M/C tubeless rear tire.. Grip Handle: An easy grip handle for easy pickup of unit in case of any accidental fall. Pedal: A foldable shift pedal for flexible foot placement that gives good riding comfort..
Maneuverability: 51 degrees of maneuverability that allows a 1.9M turn degree because of a 1360mm short wheel base..
Engine: A 2 valve fuel injection engine equipped with aluminum cylinder and forged piston. Low engine noise with very low oil consumption, a tough power unit enabling great acceleration and rich torque. Meter Panel: Speedometer and clock with twin trip meter which is perfectly iluminated for night time riding. Seat: Seat and fuel tank are designed for flexible riding positions and good balance. A height of 810mm with a well balanced cushion and shape makes it suitable for long distance riding. Disk Brake: Lightweight and compact front and rear disk- brake, 2pod caliber diameter of 245mm in the front and for 203mm in the rear..
Balance: With all weight centralized in the midle, riders enjoy great balance with a lighter and smoother feeling.